Cornwall and SDG will be showcasing their exciting heritage this weekend as part of the province wide celebration of history. Move over Cabbage Patch Kids, and make way for the region's young, artistic talent responsible for bringing the newest exciting attraction to Upper Canada Village this fall. Welcome to Cornwall and the Counties Tourism! Here you will find everything you need to know to make Cornwall and the United Counties of Stormont, Dundas and Glengarry the perfect tourist destination. Rib lovers rejoice! The Cornwall Seaway Lions Club is bringing their very own Ribfest to town, and they’re bringing one hell of a party with them. Cornwall welcomes back a familiar favorite to its restaurant community, with an upgraded feel and delicious new menu. 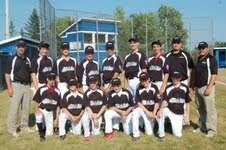 Cornwall District Minor Baseball is hosting the 2012 Junior Ontario Provincials from July 23rd to July 28th at Lutt Bergeron Sr. Memorial Field in Legion Park.